Early morning, mid June. Today Albanian adventure really begins. We’ve planned holidays in Albania months ago. There is a two days’ trip by car ahead of us. Leaving from Lodz, Poland heading to Orikum, Albania to prepare a new apartment for a rent. For the first day, we have planned to have a lunch near Polish-Slovakian border, where we pick up the third fellow-traveler; a dinner in Hungary and a supper in Serbia. Later on we will have to improvise our meals. All three of us have driving licenses, but our vehicle and its owner has come from England so the remaining two drivers would not undertake such a mission as to drive the car with a steering wheel on the wrong side (meaning on the right hand side). The car’s boot is full, some luggage is also placed under the back seat, as a result I spend the first day of our trip in a horizontal position on the back seat so I am not able to admire beautiful views, but from my friends’ comments I know that we cross Bratislava, Slovakia and Budapest, Hungary. We stop for the night in Subotica, Serbia. It is almost dark, however, we manage to find a room without any problems. The price is very competitive – we pay 6 Euro per person. Then we go for a walk along Palicko lake, which helps us a lot to relax after 14 hours spent in the car (1000km behind us already but another 1000 ahead). I begin the following day on the back seat, again. We travel through Novi Sad, Belgrade, and Nisz. We have to pay a toll on the motorway even though the road is partially under construction and there is only one lane operating each way. After crossing the border with Macedonia, the motorway is in a much better state. We pass trough Skopje and Tetovo. When we drive into the mountains I have to swap places and sit in the front seat: the road carved into serpentine is far too much for a person suffering from motion sickness. At least I can admire breathtaking mountain scenery. Still, one of the symbols of Albania? On one of the mountain passes, we cross the border between Macedonia and Albania. The driver has to pay a small fee (4 euro), and eventually we are in Albania. After driving round the next bend we can see mushroom shaped, concrete and steel bunkers popping out in the countryside ,as we will notice later, sitting apart virtually every few meters. It seems that there is still one bunker for every Albanian family today. 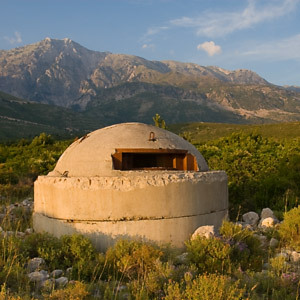 These bunkers here constructed in the times of Communist paranoia, which led the country to total isolation, meant to provide protection for the citizens of Albania in the event of an attack. We come to a stop to take a picture of a ravishing view which has unfolded itself before our eyes – lake Ohrid surrounded by a mountain chain. Suddenly, there is a tiny creature in the middle of the road. We realize that it is a tortoise trying to cross the road. Our driver decides to save its life. We pull over and put this poor being on the side. Some more distance away the road gets better, we follow a dual carriage way, called a motorway here. It is advisable to be aware of cyclists and motorcyclist who may happen to ride in opposite direction on the narrow hard shoulder. After 9pm we are finally in Vlore – the biggest city in the Albanian Riviera. The city is full of people walking down the seaside. It is Sunday evening, by the way. We can hear music from clubs; the place is vibrant with life, but we have still 15 km to reach our final destination. In the end, we are in Orikum. We unpack our luggage and find that…. there is nothing more than naked walls and dust in our apartment. It seems that we will not go to sleep too early. Although it is Sunday after 10 pm, we manage to buy some cleaning equipment in a nearby shop and we start cleaning. After a few hours, there is still a lot of dust everywhere so I decide to sleep on the balcony. Night is warm, and to my surprise there are not many mosquitoes. In the morning I can hear birds singing and I am amazed by the impressive scenery: mountains on the left, sea to the right. We decide to start a day with a swim. It takes only 10 minutes on foot to get to the nearest beach. Water is crystal-clean and there is no-one around. For the next three days we mostly keep cleaning and furnishing our apartment, but every morning and evening we go to the beach to swim in the Adriatic sea. We do enjoy cooking here, not only as there is an oven, a gas and an electric cooker in our kitchen, but also because there are no pesticides in local vegetables and fruits. Carrot smells like carrot; the smell of tomato soup, while being cooked, fills the whole second floor. Despite the fact that I suffer from food allergy, which seems to get worse during the last few years, for example I get rash or even blisters after eating fresh vegs or fruit, I decide to take a chance and….unbelievable, nothing like that takes place. It is a paradise for people with allergy problems. In the meantime, we walk around our small town. Orikum is a marvellous, tranquil place, with beautiful landscapes and local atmosphere. In the centre there are food and clothes shops, an internet spot and a bank where tourists can exchange money – the rate is similar like in Vlore. Even though almost no English is spoken, people are very friendly, and everything seems to go on smoothly. We feel good in here. One day we visit Archaeological Park of Orikum. Archeological evidence shows that Orikumi, an ancient Greek city, occupied later by the Romans as a defensive base in their wars against the Illyrians and the Macedonians in the 3rd century B.C., was a developed urban centre. The visible remains include part of the orchestra pit of a small theatre, whose capacity would have been around 400 spectators; a flight of steps cut into the rock, which led up to Orikumi’ s acropolis. 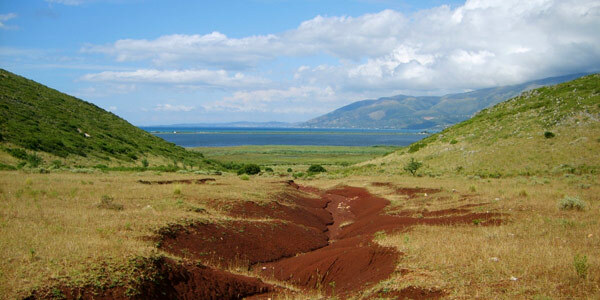 The cost of admission ranges around 700 lek (Albanian currency) for foreign visitors. On Friday the apartment is almost ready and fully furnished, there is even a washing machine. As good service reaps good reward, we are taking a day off and are heading to Dhermi – a small coastal village – famous from its beautiful beaches. We drive a road through hills and mountains which are covered in yellow grain fields and crops. Although we have read in a tourist guide booklet that roads in Albania are in a very poor state and drivers are not very cautious, we do not notice any car accidents during our stay. 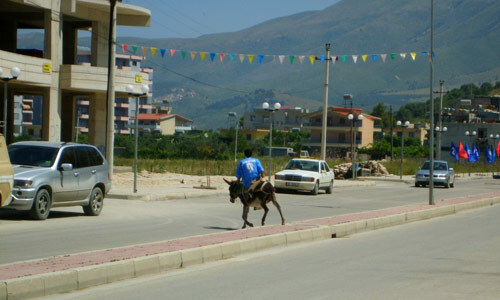 However, there could be donkey family going along the road :-). To get to the beach we have to drive off the main road. We drive on the winding stony road but our old Astra is doing well. After 15 min we are on an idyllic beach. There is only one car parked quite far ahead. We leave our belongings in the shade and take a plunge into the emerald waters- it is a great fun. This time we are swimming in the Ionian sea. The water temperature is a bit lower than in the Adriatic. We can spot shoals of small fishes. Silence, mountains and the sea. A magical freedom possesses our spirits. On the way back we stop for a quick bite in one of the seaside restaurants in Dhermi. Saturday is the final decorating/refurbishing day in our apartment. There is much fun as we are communicating in a strange Italian-Russian-English language with our Albanian decorating team. We realize quite quickly that it is a very good idea to take a native person to help with bigger shopping: there are two prices in some shops, one for the local people while the other is for tourists. Needless to say which price is better. Thanks to realizing that the owner of the apartment manages to save some decent money. In the evening we are gladly surprised that, after all the gruelling efforts we put in, our apartment became so cosy and a nice place to live in – hard to believe. Remembering that “all work and no play makes a Jack dull boy” , we decide to socialize a bit in local night clubs. There is a nice club nearby, almost on the beach about 3 km from our place, recommended by our new Albanian friends. People are few that night, and they are dancing strangely around the tables instead on the main dance floor, so we have mixed feelings about it. On Sunday we are invited by our friends to a restaurant featuring southern Albanian cuisine- fabulous food. Later we try wine from local vineyards. The wine is poured to our glasses directly from oaken kegs. The wine bought later on from local shop proves to be of the same good quality as the one tasted in vineyards , and is only 350 lek per bottle. The first week of our Albanian adventure comes to an end. On Monday we are joined by our two friends who are passing by on their way back from holidays in Greece. They decide to stay with us for a few days. Together, we decide to climb the mountains which are around our place. We have to prepare the plan for the trip by ourselves as there are no dedicated tracks for tourist whatsoever. We are not worried: there are experienced climbers among us. We assume that crossing the hills which are seen from our balcony, on foot, will take us no more than two hours. 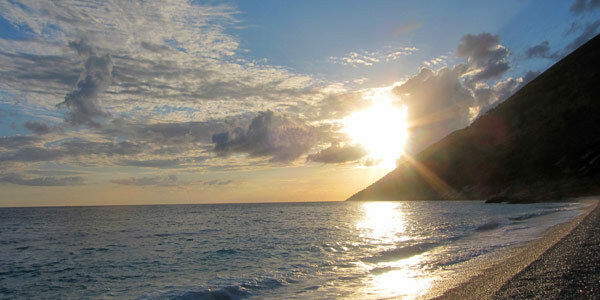 We plan to swim on the other side of the peninsula in the Ionian sea and come back the same way. We are not in a hurry then. We start at 2 pm. We admire picturesque scenery, sheeps grazing in the fields, but after 3 hours of trekking and climbing mostly through the brushwood there is still no sign of the sea. We come across abandoned military barracks instead. The sky is getting more and more cloudy, menacingly threatening a downpour. Eventually we can see the sea but still far ahead . We take a last break, share what is left to eat with a shepherd dog that joined us few hours ago. We are tired, scratched, bitten by mosquitoes and we decide to go back. The last part of the trip, we walk in complete darkness and first raindrops as a thunder is rolling. We are back finally thinking only about some wine and good sleep. Mountains and sea scenery in Orikum is magnificent. In the last few days it is raining heavily, mostly at night, but sometimes during the day, as well. This is unusual weather for this time of the year. We do not complain and swim between downpours. We also visit a 14th-century monastery, St Mary’s. The monastery looks very attractive in its tranquil, wooded setting on the island of Zvërneci. The last day of our holidays in Albania has come to an end. We do not want to leave wonderful, quiet place, but we are sure that we come back here again.